Are your print assets and print workflows secure? ... Are you sure? 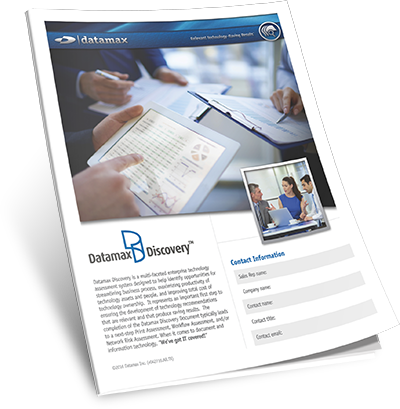 Get secure with a Datamax Print/Workflow Assessment today! Let Datamax check YOUR pulse on how secure your print assets, output, and workflows really are ... it's FREE! It's clear that protecting patient privacy has never been more critical. Current healthcare reform is bringing tighter security standards, higher reporting requirements, and greater penalties for security breaches. Providers must continue to expand their efforts to evaluate and deploy improved privacy and security technology to safeguard patient health information. how to encrypt scanned medical records and PDF documents to further ensure HIPAA and HITECH compliance. So, whether you have a good pulse (or a weak one) regarding print security within your practice, a Datamax Print/Workflow Assessment can help you avoid costly HIPAA Security Risk moving forward. Get started with a complimentary assessment TODAY! Schedule my Print/Workflow Assessment NOW! Please note we respect your privacy.